For Jim's review, published at Consortium News, see: "The Post and the Pentagon Papers". A few weeks ago Ken Burns and Lynn Novick delivered a hugely disappointing ten-part documentary entitled The Vietnam War. Tom Hanks and Steven Spielberg will now do the same for the famous Pentagon Papers case. Their film, entitled The Post, is not focused on Daniel Ellsberg. And it does not use his book Secrets as source material. Their film actually makes Ben Bradlee and Kate Graham the protagonists of the whole struggle to release the multi-volume, Defense Department study about how America got into, and stayed involved in the Vietnam War. It will therefore make Bradlee and Graham into some kind of hero and heroine of that hugely conflicting episode. To anyone who understands who Graham and Bradlee were, and the true story of what Ellsberg did, nothing could be further from the facts. 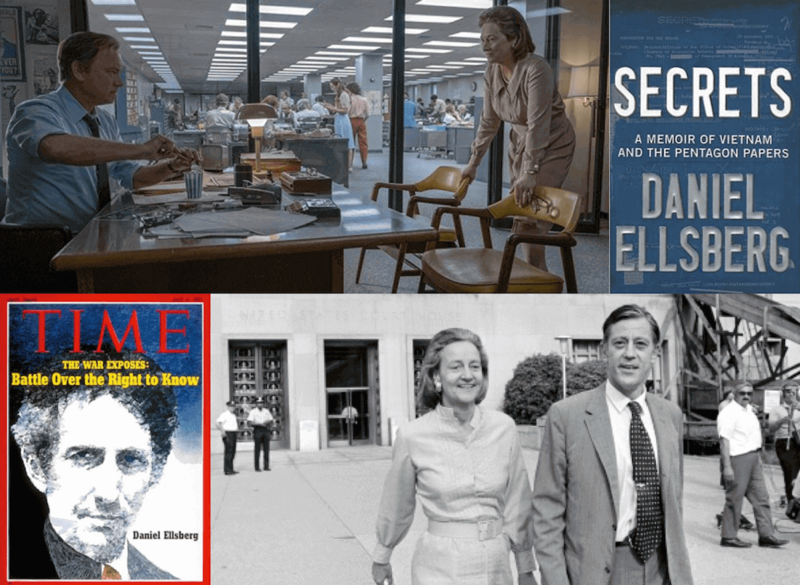 To cite just one example: in Ellsberg’s 457 page book Secrets—which chronicles the entire affair in detail—there is exactly one glancing reference to Bradlee. There are none to Graham. That is because, when one understands what Ellsberg and his cohorts were up to, the Washington Post was, if not inconsequential to the affair, extraneous to Ellsberg’s strategy. Once Ellsberg made his decision to go public with the Robert McNamara commissioned Top Secret history, it was just a matter of how many newspapers would pick up the story after the New York Times initially published it. Ellsberg and his friends had made many copies of the secret history, since he anticipated that there might be legal action against the Times to stop publishing. He and his friends had arranged for many newspaper outlets to get them once the Times was enjoined by the Nixon White House with a temporary restraining order (TRO) to halt publication. Which the Times was, after three days of stories based upon the documents. By the time the Supreme Court decided to strike down the TRO and allow publication, almost twenty newspapers throughout the country had printed sections of the Pentagon Papers. The White House had only named four of them in their legal action: the Times, the Post, the Boston Globe and the St. Louis Post Dispatch. But further, Senator Mike Gravel had read the Pentagon Papers into the Congressional Record on the floor of the Senate. And he then handed out copies to reporters who were there at the time. He then arranged for no other senator to be there so he could move to have the entire set committed to the record without objection. This was on the day the Supreme Court decision was delivered. What Gravel did—committing the documents into the Senate record— made the decision pretty much irrelevant. Gravel agreed to do this after three other senators—including George McGovern—and one congressman had refused to. Then Beacon Press, which came under great duress, published that version of the Pentagon Papers in a four-volume set. There are some heroes in this story. For example, Ellsberg, Mike Gravel, and Ellsberg’s friend Anthony Russo, who helped him copy the documents and who, like Ellsberg, risked going to jail for that act. There was also Judge Gerhard Gesell who, during two weeks of rapid, almost dizzying court hearings, ruled twice for disclosure. But Graham and Bradlee? Nothing in either of their careers merits this kind of aggrandizement. It could only happen in Tinsel Town. And in these days of MSM synergy, HBO has joined in with documentary specials on Spielberg and Bradlee. Below we link to a series of articles about Bradlee, Graham the Washington Post and Watergate. We do this so the reader will not be bamboozled by another Tom Hanks version of (ersatz) history.